Because every blog on the planet is required to have a gift guide at this time of year, AND I’m sitting on my parents’ couch watching football - I figure why not try my hand at it? Some of these items I own, some I’ve purchased for others. All geared towards our more professional purposes - none supported by ads or came with perks for me to make the recommendation. Enjoy. The Concourse Rolling Computer Bag from Mark & Graham. I own this bag, complete with my initials. I love it. It fits perfectly under the window or middle seat on Southwest flights and never does a trip go by where a complete stranger doesn’t ask where I bought it. Men and women have both asked. It’s a good find and I’m thinking through adding to my Concourse collection with the other carry-on pieces. I also have this iPad sleeve from the same company, which I also find quite handy. Also - if a loved one flies through major airports on a regular basis and doesn’t have CLEAR. I’d suggest a membership is in order. The gift of CLEAR will speed them through either pre-check or regular security lines - and admittedly make them lazier at getting to the airport on time. It’s worth every penny of the cost and I’ve even heard that many major airlines offer deals for membership to their loyalty program participants. It also makes a great gift to self. It seems unnecessary and frivolous - until you need it. Now I’d never go back. Other great travel items to consider: this Lug brand “nap sac” for long flights is a game changer, I’ve mentioned it before. ANY of these Sephora face masks would make a great stocking stuffer. I mostly love how they are packaged. You can squirt out just what you need and then use them over and over again. There are always a couple in my overnight bag because the only time I get to actually use face masks is when I’m alone in a hotel room for the night. Finally - if you work out when traveling this mini foam roller is a great option for staying flexible on the go. Let’s just say I’ve purchased more than one for my husband over the years. My feelings about fragrance are ever changing but I never leave home without one. Right now this DEBASER is all I want to smell like for the rest of my days. I bought it at a local shop in downtown Asheville a few weeks back and haven’t regretted it despite the admittedly steep price tag. They also sell a mini that could be perfect on the go. I love keeping a roller ball handy. I’ve also asked Santa for the Le Labo Discovery Set this year. Fingers crossed he makes it happen. If you have a big person in your life to give a last minute gift to it’s always loved and easy to grab a gift card to Milk & Honey spa online. It’s a top notch place with locations in Austin and Houston - and soon to be in Ft. Worth. Also they do nails and sell products in the salon. So even a smaller gift card is classy and could go a long way if you’re not ready to pop on a 90 minute swedish massage for someone. I’m also a firm believer in (if you’re able) to gift items your friends are unlikely to splurge on themselves. For me Aesop’s Resurrection Hand Balm fits this bill - plus it comes in 2 sizes. I have yet to meet a woman in her 30’s who hasn’t thought about buying it for herself. A friend of ours, Jay B. Sauceda, is a pretty accomplished photographer and he’s just come out with a great book of aerial views of our great state called A Mile Above Texas. I’d recommend snagging a copy for any Texan on your personal or professional gift list and right now you can get a signed copy on his website for $40. Another great idea for family members that are really into the idea of you working in and around the Captiol - last year Governor Abbott sold Capitol Christmas ornaments that were signed in exchange for a $40 political contribution. I’m not sure if this will be done in 2019 but it made for a great gift. Even if unsigned Capitol Christmas Ornaments are always a good idea. And for the teeniest Texans, Biscuit in Houston makes the sweetest cactus-ridden jammies. Get yours here. I also love their Wimberly and Marfa stationery. 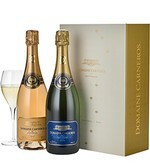 I’ve had a colleague gift me this Domaine Carneros sparkling rose duet each Christmas and it doesn’t disappoint. It’s so good and a welcome bottle to have around during the holiday season. Get your gift set here. It’s so good I eventually became a member of the winery myself. For hostess gifts I’m pretty predictable usually bringing a bottle of wine, or this candle if it’s a big party and a VERY good friend. I also love the idea of gifting something like Reese Witherspoon or Chrissy Teigan’s new book. If you know they don’t have it it’s a fun way to encourage them to continue hosting. I’ve also been known to show up with $25 Central Market or Whole Foods gift cards in a Christmas card for my hosts and those also always seem appreciated. If you have more time on your hands and want to get very personal - consider personalized stationary from Dixie Designs. The designs are quite southern and unique you’re guaranteed to be one of a kind - I’ve gifted the fleur de lis notecards to a good friend from New Orleans and she loved them. I also have these company print my professional Christmas cards each year as well as my personal correspondence cards. So many great designs! Friends came over for dinner tonight and it's foggy, rainy and just the right temperature for some green chili pork. And because I can only eat green chili with buttered tortillas a la Roaring Fork here's the recipe and notes on my adaptations below. In a small stock pot, saute vegetables until tender. Add diced pork. Add all dry ingredients. Stir well for a couple of minutes, blend well. Add chicken stock and let simmer on low to medium heat for one and a half hours or until fork-tender. ADAPTATION: I stirred in the dry ingredients for a couple of minutes and then transferred the mixture to a crockpot and cooked it on high for 3 hours. Season with salt and pepper just before serving to taste. Serve in a warmed butter tortilla, topped with shredded pepperjack cheese. As someone who resides in central Austin but outside of downtown I am constantly on the look out for go-to business lunch options closer to my home (which also happens to be my office). Slowly but surely classy joints are coming my way. Smaller crowds, fewer suits and free parking will always be my jam. Today, I met a colleague at Tiny Boxwoods Austin and it checked every box on my list. The light and bright atmosphere is casual and inviting with shiplap for days, but it stays on the right side of feminine to make it perfect for meeting anyone at anytime. Additionally the service is stellar, the food delicious and it won't break my expense budget. I put the $2.50 chocolate chip cookies to go on my personal credit card BTW. Try the salmon provencal for $18.00 and call me if you need a date.